It’s true. I read every single Harry Potter book, but this wasn’t Harry Potter. That was about wizards, and good and evil, and growing up, and friendship, and butter beer! This was probably some kind of Twilight spin-off full of conflicted teenagers whining about how they shouldn’t be in love with vampires and werewolves. It wasn’t the most persuasive thing he could have said, but Joseph must have been sure that once the seed was planted in my mind, curiosity would get the better of me. The next time I saw him, I told Joseph that it was completely his fault that I went to bed at 4:45 AM and was raccoon-eyed and foggy-minded for the rest of the day. I did. I read it cover to cover. In one night. Straight through. And I loved it. I was completely hooked. Yes, The Hunger Games series is clearly Young Adult Fiction. As befits the genre, sometimes the books can be a little repetitive (okay! I thought by Chapter 3 of the first book, I get it! She hunts!). They are also fast-paced and packed full of action. The narratives are straightforward, and the books are emotional and plot-driven. It’s the world from the perspective of kids. But just because the target audience of The Hunger Games is young, doesn’t mean that any of the books in the series are simplistic. In fact, what makes the books so good is how they use food to illustrate complex ideas and to represent the complicated relationships between different characters, different people, and different social classes. I’ve even read some other things about how the story can be read as an allegory for our current food system and its potential unsustainability, how Katniss herself can be seen as a model of locavorism as a girl who is forced outside of her manufactured food system in order to survive, and how hunting, foraging and sometimes going without — as Katniss does — is a healthier model of eating than what is offered by the super-sized Capitol (thanks, Charlene!). The Hunger Games takes place in a postapocalyptic future in roughly what is used to be North America. Now known as the dystopian Panem, the state is divided into 13 districts — one of which was annihilated after fomenting rebellion, leaving 12 under the rule of the Capitol. As a means to control the remaining districts, the Hunger Games were created as annual televised event reminding everyone of the power that the Capitol holds over them. Participation is mandatory and each year, each district must send one boy and one girl between the ages of 12-18 to participate in a gladiatorial-like game set in an artificially constructed arena that may or may not kill them if their fellow gladiators — called tributes — don’t get to them first. There can only be one survivor, and the child who manages to be survive earns precious food and oil for their starving district. The book’s main protagonist is a 16-year old girl from Panem’s poorest district, District 12. Her name is Katniss Everdeen and, as explained so well by Joseph, she is a hunter. More than a hunter though, she is a survivor: tough, capable, resourceful, skilled, and lethal . . . to animals (but as another character points out, are kids really that different?). The story is told from her point of view, and hardly a page goes by without the mention of food. Food is everywhere in The Hunger Games. It is what everyone in every district outside of the Capitol is obsessed with because just about everyone outside of the Capitol is starving. The decadent Capitol produces nothing. It is reliant on the outlying districts to provide everything from its food to its fuel to its manufactured goods. However, the Capitol’s citizens want for nothing, and what the districts produce is never meant for their own consumption. Not only is this power dynamic illustrated through the difference between the kinds of food eaten in the Capitol (rich, elegant, sophisticated, refined, and luxurious) and what is eaten in the districts (rough, unrefined foods like ration grains, or things that people eat out of desperation like the pine wood and wild dog), but in sheer quantity as well. People in the Capitol have so much to eat (and eat so much it) that they enjoy making themselves sick just so they can empty their stomachs and continue eating more. This would be inconceivable to people in districts who have never had enough to eat. If this all sounds very Roman to you, it is pretty obvious that author Suzanne Collins intends it to be. From the idea of a gladiatorial fight to the finish, or to the use of food as a way to symbolize the contrast between the decadence of the Haves in the Capitol and the Have-Nots in the districts, Rome overshadows everything in the series. Characters have Roman names (Seneca, Cato, Cinna, Plutarch). Even the name Panem derives itself, not from Pan-American, but from the Latin phrase panem et circenses which means bread and circuses — the Roman means of appeasing and controlling populations through food and entertainment. Speaking of bread, every single district has its own, from the rough drop biscuits of District 12, to the ultra-refined rolls of the Capitol. Bread — like all food in The Hunger Games — is used to communicate all kinds of relationships. For example, when Katniss and her fellow tribute from District 12, Peeta Mellark, are transported to the Capitol for training before the games, every table is set to include a basket of bread with representative loaves from each of the 12 districts and from the Capitol. The inclusion of the Capitol’s bread is a symbolic reminder of its power and superiority among those rougher, unsophisticated loaves. As you can see, there is a lot in the book to think about. You probably also guessed that I had been very anxiously awaiting the The Hunger Games movie that just came out last week. I was so excited about it that I cooked a Hunger Games feast using recipes from, or adapted from The Unofficial Hunger Games Cookbook by Emily Ansara Baines before dragging my friends to the midnight IMAX showing of the film. What did we eat? A “Caesar” salad consisting of chopped Romaine lettuce simply dressed in a lemon juice vinaigrette with lots of grated Parmesan and freshly ground black pepper. It was meant to be a nod to The Hunger Games‘s Roman roots even though Caesar salad has nothing to do with Rome (it was invented in Mexico by a guy named Caesar). 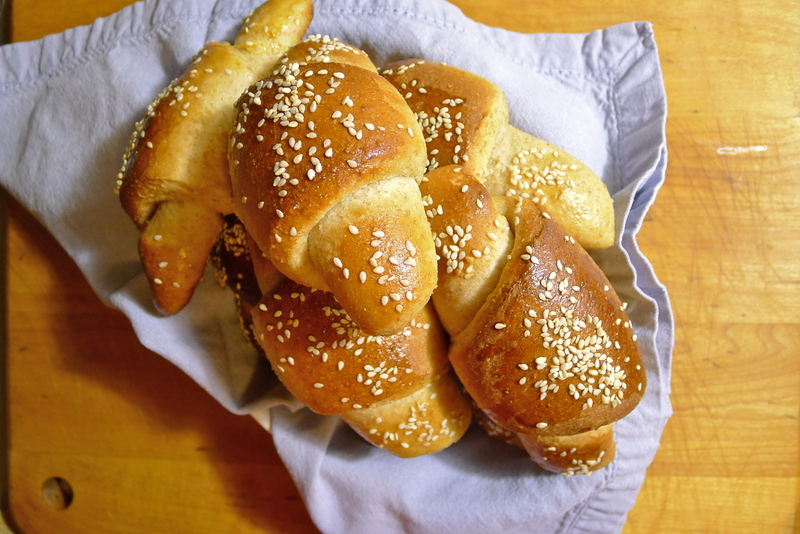 District 11’s Crescent Moon Rolls with Sesame Seeds, because how could a Hunger Games-themed dinner not include bread? Especially this bread, as those of you who have read the books know. Katniss’s Favorite Lamb Stew with Dried Plums, the name says it all. But read further along to hear more about that story! And Rum-macerated Strawberries with Prim’s Goat’s Milk Ice Cream, which was simply quartered strawberries tossed in sugar, a sprinkle of salt, and a few splashes of rum, served over goat’s milk ice cream. It was so much fun. I can’t wait to do this for the second movie! 1. Sift together the two flours into a large bowl. 2. In another large bowl, dissolve the yeast in the warm water. Using an electric mixer, add the sugar, the salt, 2 eggs, 1/2 cup of butter, and half of the flour mixture to the dissolved yeast. Beat everything together until it is smooth, about 5 minutes. Add the remaining flour mixture and beat everything together until it is smooth again. 3. Scrape the dough out onto a lightly floured surface. Using your hands, knead the dough for about ten minutes. Place the dough in a lightly oiled bowl, cover it, and let it rise in a warm place until the dough has almost doubled in size. This can take anywhere between 1 1/2 to 2 hours. 4. Line a cookie sheet with parchment paper. Punch down the dough and divide it roughly in half. Shape each half into a ball and roll each ball out into a 12-inch circle. Use a butter knife to spread half of the remaining 1/4 cup of butter evenly across the circle. Sprinkle with salt. Using a pizza cutter, cut each circle into 8 wedges. Starting at the wide end, roll each wedge up towards its point. Arrange the rolls, point-side down, about an inch apart from each other on the baking sheet. At this point, you can curve the ends inward to make more of a crescent shape. You may need to use more than one baking sheet. Cover the rolls again and let them rise until they are almost doubled, between 90 minutes to 2 hours. 6. When the rolls have doubled again in size, brush them with an egg wash made from one beaten egg and a tablespoon of milk. Sprinkle each roll with sesame seeds. Bake the rolls in the over for about 12-15 minutes, or until they are golden brown. Kind of how all bourbon is whisky, but not all whisky is bourbon, all prunes are plums, but not all plums are prunes. Prune plums are generally the plum variety that is almost always dried before eating. And this recipe called for 5 cups of them. 5 cups of prunes. For those of you who haven’t read the book, or are currently in the process of reading it, I apologize in advance if I give away a little bit of the story to you. You know that when Katniss and Peeta are in the cave? When they’re starving the in the cave and they get sent a large tureen of this stew from their sponsors? I don’t know about you, but if I were Haymitch, I wouldn’t send my tributes a big pot of steaming lamb and prunes. Not a good idea. I would send them something else, like that creamy chicken dish with oranges or some cookies. Because if the whole goal is to not get killed in the arena, I would try my best to not put my tributes in the position to literally be caught with their pants down. Seriously. Not to be crude or anything, but I strongly think that this recipe should be renamed Katniss’s Favorite Natural Laxative with Stewed Lamb. It was tasty, but I feel like it is my duty to warn you if you attempt this at home — especially if there are leftovers. 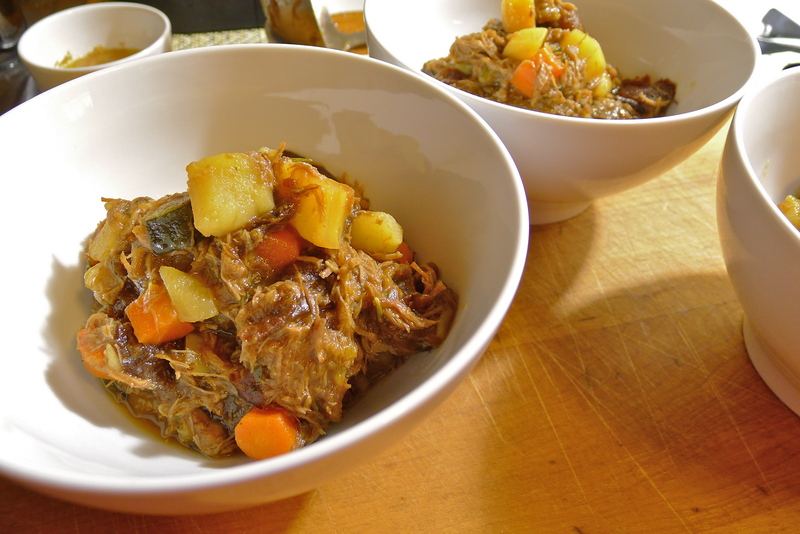 Despite halving the amounts of almost all the recipe’s ingredients (the original called for a insane 5 pounds of lamb), there was still so much stew that it completely filled up a 5-quart Dutch oven to the rim. I had to transfer the stew to an 8-quart stew pot, but even then, the pot was uncomfortably full. What would have happened if I made the recipe exactly as specified? Would I have had to have used a swimming pool? Even after feeding myself and my friends, I was still left with unholy amounts of stew — enough to soften the stool of a small Roman army. So if I were you, I would go ahead and halve the recipe again one step further. 1. In a large mixing bowl, generously season the lamb with salt and pepper. Toss the meat to coat it evenly with the seasoning. 2. Heat the olive oil in a large cast-iron skillet over medium-high heat. Sear the lamb cubes on all sides, working in batches if you need to. Remove the lamb to a large stew pot or a lidded casserole. 3. Spoon off all the fat except for about a tablespoon. Add the onion to the pan. Sauté it until it just begins to turn translucent. Add the garlic and continue to sauté everything together until the onion begins to turn golden. Carefully add about 1/2 cup of water to the pan. Cook to reduce the liquid by half. As the liquid reduces, gently scrape the bottom of the pan to release and dissolve the fond. Add the garlic-onion mixture to the lamb. 4. Dissolve the two sugars in the beef stock and add it to the lamb. The liquid should cover it completely. Bring everything to a boil, then cover the pot and simmer the lamb for about an hour. 5. Add the vegetables, the prunes, the herbs, and the ginger ale to the pot. Cover the stew again and simmer it for about 30-45 minutes more. You may need to add more water or stock if the stew looks too thick. The meat should be falling apart, and the vegetables should be tender when the stew is done. Adjust the seasoning and serve. OK, I guess even though I’m clearly not a young adult (! ), I probably need to read those books. Goodness knows I can’t avoid hearing about them these days, as Jennifer Lawrence is from here and is in our local newspaper on a daily basis. Whether or not I succumb, though, I must say those rolls look wonderful! I can imagine that you are pretty inundated with news of the hometown girl turned Hollywood blockbuster screen star. I saw her in A Winter’s Bone and thought she was amazing. She is a great as Katniss too. I can’t really imagine any other actress in the role, although, at 20? 21? she’s a little too curvy to completely pull it off. The books are a fast read, they are just really long books. If anything, I was just so surprised how much they made me think. I would recommend trying one. It’s always fun to just fall down the rabbit hole for an hour or two! I haven’t read these books or seen the movie because, well, I prefer comedy. But I am a bit fascinated after learning about the food themes! And those rolls do look very, very good. Thanks, Emmy! I had forgotten how much work kneading dough was. After ten minutes, I could totally feel the burn. I briefly thought that this would be an excellent way to work out, build up some awesome biceps. But then I realized that all that work would be negated by eating all that home-made bread! I LOVE how you have tackled this book with a foodie slant. When I heard about this movie (I heard of the movie before the book), I was disappointed that it didn’t seem to be about food. But I’m glad I read your review and that there is plenty of food in the pages, even if it’s not so much in the movie. I will definitely be giving this book my attention sometime soon. A Hunger Games feast before seeing the movie. What a great idea! I had to skim some of your posts because I don’t want to spoil for myself but maybe by the time I start reading I would have forgotten again. I just had a talk with a friend of mine about how they left so much about the food out of the movie. I guess if they didn’t, the movie would have to be 5 hours long! It can’t be easy to adapt material for the screen, especially the first in a series because you need to give all that expository information. I would definitely recommend reading the books, though! And I am very much looking forward to cooking books 2 and 3! Hungry all right after reading this! The books made me so hungry! There was one scene in the second book where they go around this catered cocktail party in the Capitol. It was crazy delicious-sounding! Indeed! A lot of the recipes in the Hunger Games are either pretty hearty, or pretty decadent. Definitely winter weather-bulky sweater-heavy coat kind of food! Oh that stew looks so incredibly delectable and rich. Yummy for my tummy! The ginger ale component is interesting. I bet it gives the stew a unique and tasty flavor. I can’t wait until we move (hopefully) into our new home and get all settled in so I have more time on my hands. I downloaded the Hunger Games but I haven’t had a real chance to read it yet. Argh! I am very happy that young kids have books that they *want* to read which will get them motivated to read and excited to read. This is a chance for parents and teachers to instill a life long love of books into young people. When I was in school the teachers basically said, “You’re going to read Shakespeare and you’re going to like it.” Well, I ended up hating it. I’d read the books the night before, take the test, and promptly forgot everything afterwards. It all seemed so pointless. Work for the sake of work. If I had been assigned something like The Hunger Games, well, maybe I would have felt differently about school. I also am excited for young people because they have so many ways to express themselves now and share what they love thru You Tube, blogs, Twitter, videos, message boards, etc. Geez….when I was growing up it was a book report written by hand or nothing. I think the Hunger Games is a real chance to get kids to exchange important ideas/thoughts and get them motivated to read/ learn. We live in such an exciting time with so opportunities right at people’s fingertips. I wish I could go back in time and attend middle/high school now. I’m sort of jealous of kids these days. The next time I talk to my dad I’m going to tell him about the Hunger Game books. I think these books may be perfect for some of his students. I used a natural ginger ale for the stew, and the gingery-ness grew stronger the longer it sat. It’s true though, kids these days have a lot of options in terms of books. I am trying to remember the series that I had as a kid . . . The Babysitter’s Club? Sweet Valley High? Kind of lame in comparison! Judy Blume. Little House on the Prairie. Lame. Choose your own adventure books. Pretty cool. Hunger Games (if it had been available back then). Awesome! Whoo hoo! Wow! You read fast! But then again, it’s hard not to with The Hunger Games! I remember Judy Blume and Little House on the Prairie. Especially Little House. One particular memory sticks out: the one where Laura’s mom fries up dough balls in fat. Oh yeah! Choose Your Own Adventure Books were awesome too, even though I never managed to choose the winning path and always ended up dying in really horrible ways! I know what you mean! I thought that I only had enough room in my shriveled little adult heart for one Young Adult Fiction series. But it turns out I have room for two! Aw, thanks! They were yummy! The Hunger Games sounds a bit full on for kids? Apparently its a pretty graphic film too! My 11 year old will of course love it. The bread rolls look amazing with that lamb. I shy away from baking I have an ‘issue’ with it for some reason. I think it’s pretty violent for kids. I had a student who told me that she was taking her six-year old, and I asked her if she knew anything about the Hunger Games. She said no, but the whole kindergarten class was going. I told her to read the reviews and strongly urged her to keep her kid at home! I just can’t believe that no parent, and none of the teachers knew better! 11 is just okay, I think, but six?! I’m trying to get better at baking myself! I think what always gives me pause is that I have to be really exact with my measurements. Not very good at following recipes to the letter either . . .
No worries! That has happened to me too! Thanks for all the comments. I love them all!